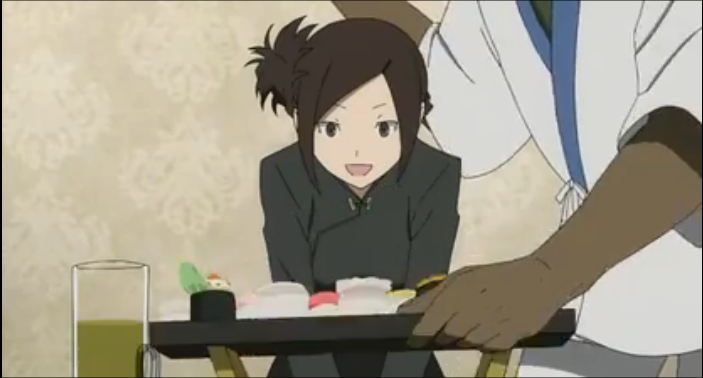 Episode 20 of Durarara!! 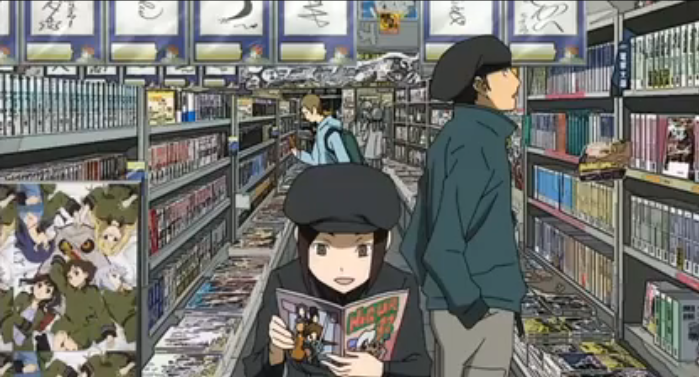 features Kadota’s gang, and more of Izaya’s masterful trolling. Meanwhile the leaders of the three factions fail to take advantage of the opportunities of their encounters to defuse the tension between Ikebukuro’s gangs. Don't be shocked! Erika and Walker narrate this episode. Masaomi Kida meets with Kyohei Kadota and his gang members at Russian Sushi. Masaomi is hoping to get information on the leader of the Dollars. They try to dissuade him, in fact they take offense at his one-sided recollection of the conflict between the Yellow Scarves and the Blue Squares. Now he seems ready to start a fight with their current gang, the Dollars. As the conversation gets heated, the old chef hurls a knife into the room, which Walker and Erika think is really cool. At this point it is pure speculation by two characters who admit to indulging in fantasies, but Simon and the Chef at the Russian Sushi restaurant seem to have a lot more intensity to them than their professions explain. I usually don’t engage in calls for a second season, because I would rather have a strong plot than endless hijinks, no matter how lovable the characters, but DRRR has such a large cast of strong characters (and an established series of light novels, from a writer who knows how to assemble a great plot), that I could really see this show getting another season to give some of the side characters a chance to own a piece of the story line. Erika Karisawa and Kyohei Kadota are rarely seen without their hats. Kadota does give Kida a phone number for someone who knows who the Dollars leader really is. There really is no surprise when that turns out to be Izaya Orihara. As I mentioned last week, Izaya is a master troller precisely because he provides truthful information. He just provides only the information that he wants to reveal, and he provides it in a way that maximizes the effect he is going for. 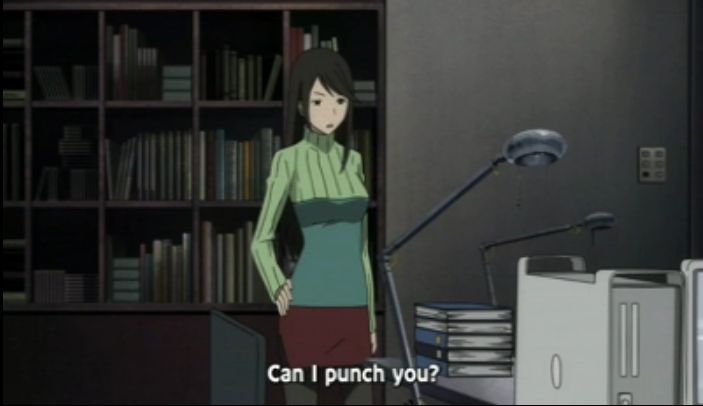 In this case, Izaya works Masaomi up emotionally, then he asks him how Mikado is doing. Now Izaya knows damned well how he’s doing, since he chats with him on a regular basis, but when Masaomi answers that Mikado is enjoying a peaceful life, Izaya is set up for his kill shot. He knows that Mikado actually is frantically trying to find a way to peace between the gangs, and he also knows that the Dollars have nothing to do with the Slasher, but he tells Masaomi that Mikado is the leader of the Dollars in a way that insinuates exactly the opposite. Poor Dota-chin! You can just tell by that look on his face that hanging out with Erika and Walker gets annoying at times. Bonus screencap, because a post can never have too much Erika in it. As if that weren’t enough, Izaya also spreads the rumor that the head of the Yellow Scarves is looking to attack the Dollars’ leader to Anri and Mikado. Although Anri tries to talk to Masaomi, events overwhelm them, and a Dollars member is seriously injured before she can find a way to do so. 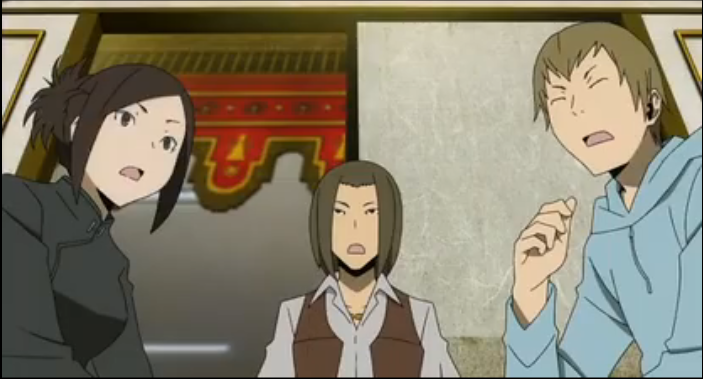 Despite Kida’s concern that the Blue Squares had infiltrated the Dollars, Blue Squares members that have infiltrated the Yellow Scarves reject his orders to avoid conflict, and seriously beat Ryo Takiguchi, the harmonica-playing Dollars member that Masaomi and Mikado met on the roof about ten episodes back. 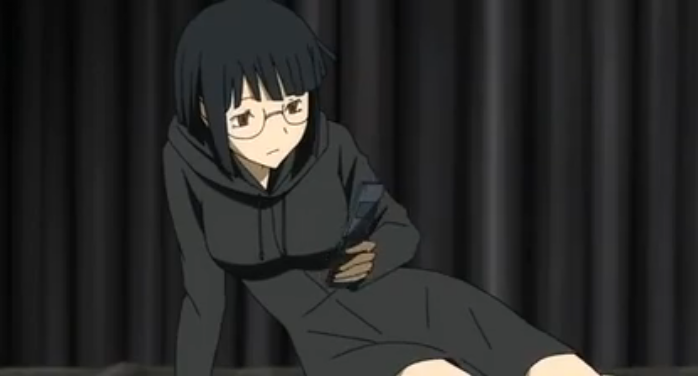 Anri still doesn't have all the pieces. Kind of a boring episode, but lots of information! I did enjoy how Izaya sort of wanted Kida to piece together Mikado as the Dollars leader kind of funny. 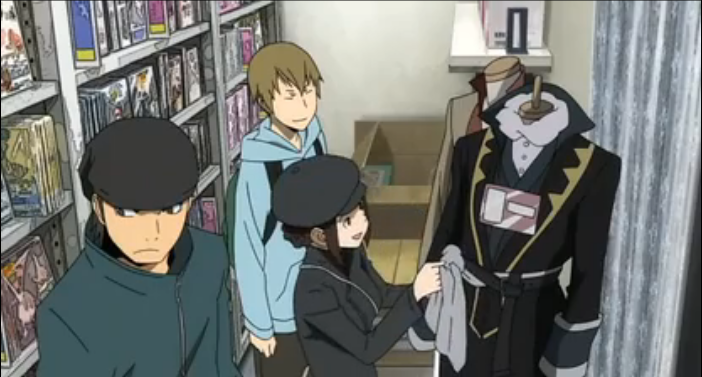 The best part of Izaya is that he lets the stupid characters off themselves, just like Rio. Still, I agree with foshizzel; this was a boring episode. 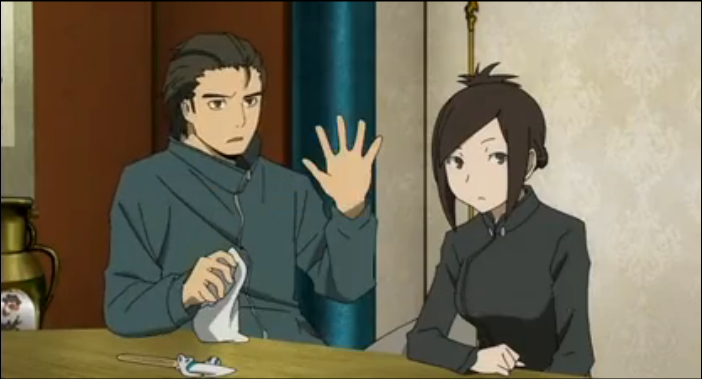 I would agree with foshizzel and kabitzin that the episode was pretty slow as per the Drrr!! pacing. Though, Karisawa and Yummachi made it total WIN! These two have a pair of twisted minds alright! I hope Kida, at the very least, finds out from Ryo that the Yellow Scarves committed a completely unprovoked, and brutal, hit. He needs to learn that his own troops are as much the problem as the solution. Unfortunately I don’t have a lot of faith in Kida. He made a bad mistake going back to Izaya. He’ll probably make another.